Posted on 8, July 2016 by EuropaWire PR Editors | This entry was posted in Denmark, Media, Real Estate and tagged Egmont, magazine, RUM International. Bookmark the permalink. COPENHAGEN, 08-Jul-2016 — /EuropaWire/ — The success has been overwhelming and Egmont is now printing a second edition of RUM International. The international Egmont magazine RUM International is loved in Milan, Berlin, London and New York, and the first edition of the magazine was torn away. RUM International was published for the first time in April this year, and it has been successful to such a degree that Egmont now prints a second edition. “It is rare that we reprint. The magazine has been extremely well received. RUM can definitely carry an international version”, says commercial director at Egmont Publishing Frank Vilstrup. “It’s been sold out so quickly and we get inquiries from all over the world from people who want to buy or sell the magazine. At the same time we are at the right places in Milan, Berlin, London and New York, where major lifestyle magazines are being sold, “she says. Among the international retailers are Barnes & Noble (US), WHSmith (UK), Selfridge’s (UK), Papercut (Stockholm) Do you read me? (Berlin), Corso Como (Milano), Armani Libri (Milano), Tsutaya Books Tsite (Tokyo) Design Republic (Shanghai) – og CasaShop in Copenhagen. 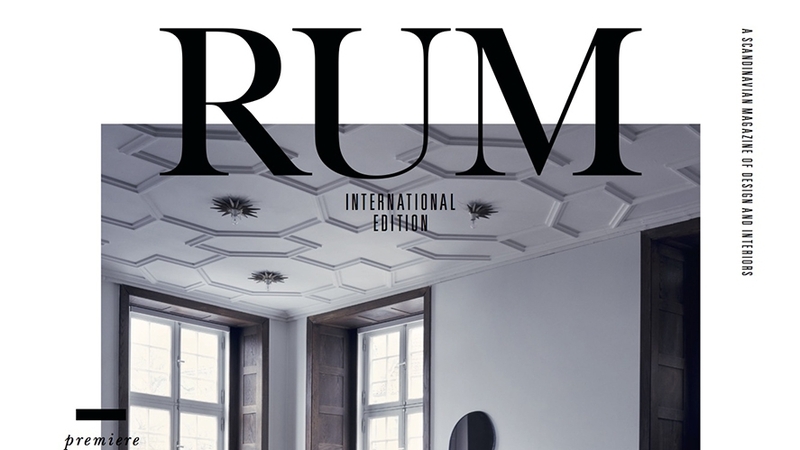 With its foundation in Scandinavian design, interiors and architecture and its international vision RUM International has a position that is unique in the market, Frank Vilstrup says. “And thus we appeal to internationally-oriented advertisers, both Danish and foreign,” he says. Scandinavia and especially Copenhagen are special when it comes to ‘living’. This was confirmed when the people behind the American lifestyle magazine Kinfolk recently moved their base to the Danish capital. “We must be aware that we have something special to offer. Therefore, we also believe in RUM International in the future”, says Frank Vilstrup. The next edition of the successful magazine arrives on the shelves worldwide next spring. Fans of RUM International can enjoy second edition of the Danish version when it is out 21 July. Egmont Publishing is part of Egmont, a leading Nordic media group, with activities in 30 countries and 6,600 employees. We produce high-quality content and digital innovation in e.g. Nordisk Film, TV 2 in Norway, cinemas, book and education publishing and PlayStation. We publish over 700 magazines and children books. Egmont is a commercial foundation that generates revenue amounting to EUR 1.6 billion. We donate over EUR 10 million a year to help improve the lives of children and young people. We bring stories to life. Egmont is a leading media group in the Nordic region with activities in 30 countries and 6,600 employees, producing high-quality content and digital innovation. We are responsible for Nordisk Film and TV 2 in Norway, book publishing and Egmont Publishing, and are part owners of other joint venture businesses e.g. Zentropa. We publish over 700 magazine titles, broadcast 154 hours of TV each day, publish 2,200 new books every year, co-produce 24 films a year, sell 1,000 PlayStation consoles a day – and more. Egmont is a commercial foundation which generated revenue amounting to EUR 1.6 billion in 2015. We donate over EUR 10 million a year to help improve the lives of children and young people. We bring stories to life.